Finance functions have been transforming themselves in recent years with the aim of evolving from a "data producer" to a "strategic business partner" for their internal clients. Robotic process automation (RPA) is an interesting and effective lever to achieve this transformation as it replaces repetitive, manual tasks with an automated process generating substantial productivity gains around production. 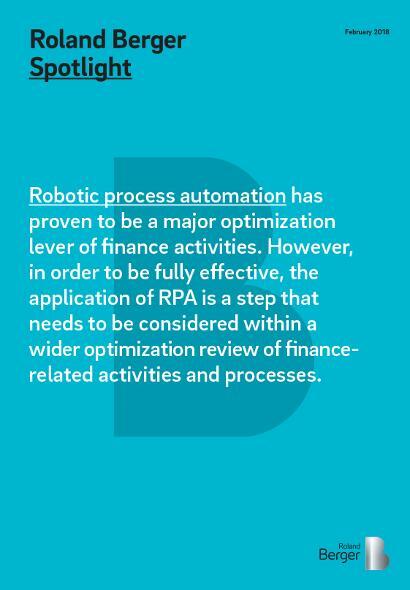 In order to be fully effective, the application of RPA is a step that needs to be considered within a wider optimization review of finance-related activities and processes, according to the latest Roland Berger study, "Robotic process automation in finance activities". Robotic Process Automation has proven as a major optimization lever within financial activities. "Our experience shows that RPA is usually well accepted within Finance teams as it impacts predominantly the most manual activities and those with little added value. As such, RPA is a key contributor to the transformation of finance functions from the role of 'data producer' to the role of 'strategic business partner' as it enables them to free up workload in production, control, consolidation and reconciliation related tasks," explains Axel Böhlke, Principal at Roland Berger Belgium. The transformation of the finance functions is taking place in a complex context. First, Finance has a growing role in strategy development and support, thus requiring a higher level of business insights. There is also a growing pressure on the timing (i.e. accounting, closing, regulatory reporting, budgeting/forecasting process) and costs (i.e. finance function costs as well as total group costs) of financial and accounting data production and analysis. On top of that, expectations and workload related to regulatory requirements are surging as companies strive to achieve compliance with International Financial Reporting Standard 9 (IFRS 9), which became effective on January 1st, 2018. In recent years, Roland Berger has conducted numerous assignments in the field of RPA in finance functions across various industries and identified numerous benefits. Optimization potential is significant and typically reaches up to 20-25%. Development and implementation of an RPA solution is relatively quick, typically taking between 6 and 14 weeks and payback periods are usually around 4 to 8 months. RPA is an interesting and effective lever to replace repetitive, manual tasks with an automated process generating substantial productivity gains around production, control, consolidation and reconciliation tasks. "To be fully effective, it needs to come after a process simplification and harmonization effort and it has to be coupled with an analysis of the long-term end-to-end automation potential of accounting and financial production flows and an analysis of the expected evolution of HR needs and related skills/competencies in the parameters within which it is being rolled out," concludes Axel Böhlke.